Legal and media analyst Lionel explains how cell phone companies take advantage of their customers who never read the consent form about where the personal information goes, allowing the companies to track the users’ data. The latest in population control technology is being unveiled in Singapore, where the elderly are now being used as human guinea pigs in a collaborative trial to see how effectively humans can be tracked using wireless sensor technology. According to The Straits Times, two senior studio apartments have already been equipped with the technology, including the installation of seven small sensors strategically placed throughout the premises that actively monitor the whereabouts of the seniors who live there. Every time Madam Ng Siew Eng, one of the participating elderly patients, leaves her house, her caretakers and family members are able to track her whereabouts thanks to a special device attached to her house keys. This device communicates remotely with a server that keeps tabs on her every move, that way if someone is needing to find her they can do so in real time, should an unexpected emergency occur. While in her home, Madam Ng can also be monitored by the small devices attached to the walls of her living room, bedroom, bathroom, and kitchen. As she roams about her home, these devices communicate with the third party server to make sure she hasn’t fallen, for instance, or isn’t having trouble breathing. The system is even capable of monitoring her sleeping patterns. Madam Ng’s apartment is one of two in the area that’s being preliminarily tested as part of a six-month trial being conducted by Adventist Home for the Elders and a local technology startup known as ConnectedLife. If successful – which by all indications so far, those in participation are favorable towards it – the technology could see greater expansion in the coming months and years. Human monitoring has its benefits, but is it just more ‘Big Brother’ in our lives? The technology is equipped with various “smart” elements as well that can detect unusual behavioral patterns that might indicate a person is injured or even dead. Spending too much time in the bathroom, for instance – “too much time” being inordinate amounts that break typical patterns – would trigger a call to a local family member or caregiver, who would know to come and check on the individual. Tracking systems such as this one also allow seniors more freedom, advocates claim, giving them greater confidence to go more places without worrying that they might get lost or hurt. And their loved ones are then faced with less worry about what might happen out of eyeshot or earshot, a win-win for seniors in terms of prolonged independence during their latter years. Josephine Teo, Senior Minister of State at the Prime Minister’s Office, believes the technology is a wonder for seniors, and that it provides everyone involved greater peace of mind – which it definitely does. But such technology isn’t without its fair share of privacy concerns, as having a constant “eye” inside the home and on one’s person 24 hours a day leaves the door open for more government invasion into our lives. Yahoo just got caught handing over user email and data to the FBI. They’ve also had their user data hacked. Now, the company wants to build more spy technology – billboards to track every single driver. You may not have noticed, but there are two kinds of countries in the world these days: Dictatorships led by authoritarians and democracies that are slowly being taken over by authoritarians. Put Australia into the latter. Organic & Healthy reports that the land Down Under has become the first nation to begin microchipping its citizens, though NBC News predicted some years ago that, by 2017, Americans would all be microchipped. 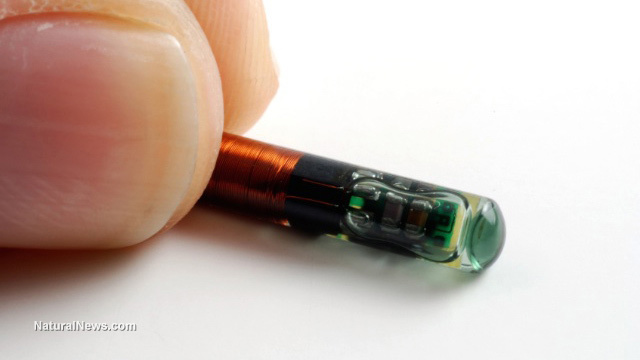 Australia’s drive to implant citizens with what many believe is the Biblical “mark of the beast” is “a clever propaganda campaign that equates RFID microchipping with becoming superhuman, and people are begging for it,” News.com.au noted. One Australian woman, Shanti Korporaal, from Sydney, is at the center of a controversy after having implants inserted in both hands. “You could set up your life so you never have to worry about any passwords or PINs,” she told News.com.au. The idea is that microchip implants give you a unique identifier, so your implant can be used to get into locked doors, transfer personal information to smart phones and other personal devices – and, of course, allow you to be tracked everywhere you go by government. As bad as it is to carry cards around that transfer personal and financial data to massive (hackable) databases and smartphones that serve as personal tracking devices – again, out of convenience – you at least have the option (for now) of leaving them behind when you go somewhere. You don’t have to take a smartphone with you, or at minimum you can learn some ways to better protect your information. With cards, if you must carry them, there are devices you can use to essentially shield them from ID thieves and tracking devices. But once you put a tracking device under your skin, the only way to get rid of it is to have it surgically removed, or hack off your limb. Would authorities actually track you for no reason? It’s already being done. Why make it easier to track you? Another major problem is hacking and identity theft. In the NBC News report of several years ago, reporters noted that one of the “problems” that could be solved had to do with medical information: Chips would allow doctors and hospitals to have access to your identity and medical record if you were unconscious and unaccompanied upon admission (and how often does that happen?). But medical information is a top target of hackers and identity thieves. In fact, health care information is the most coveted by cyber thieves because data contained in health records – prescriptions, Social Security numbers, addresses, etc. – are much more permanent than, say, financial data (which is changed once a hack has been detected). Privacy in a digital world comes at a premium as it is. Our retinas are scanned, our wallets are scanned, our online data is hacked and our movements are already being tracked – both by government and by private corporations. But all of those methods can be mitigated. It’s very difficult to mitigate personal tracking when you’re carrying the tracker inside your body. The point is, if government can track you 24/7/365, government can control you as well.